I collect Monopoly boards. I currently have 2,249 sets and am recognized by Guinness as the World Record holder for that count, which was verified by them in January 2019. I purchased my first Monopoly game while I was on holiday in 2006; I bought it as a souvenir of that trip because it had all the places on the board that we visited. Wherever I go now, I look for unique sets for my collection. In August 2018, I took possession of my 2,000th game atop the Sydney Harbour Bridge. It was presented to me by Uncle Pennybags himself! I rent off-site storage for my collection. Most of my games are still in their plastic packaging; I don’t play them. I do have a few vintage sets that are open, of course. When I get a new set, I take photos of the front and back of the box as well as the barcode. I then add it to my list of sets, where I picked it up, and the year. I do this in part for Guinness, so I can give them updates on my collection. There’s a cost to having Guinness visit in person, about £10,000. That’s a lot of new games I could buy so I don’t have them out to update the count often. The next largest Monopoly collection numbers in the hundreds; I’m well ahead of that. What do you consider to be the Holy Grail of Monopoly boards? My most prized board is Monopoly 1,000,000th Edition. It was created by game publisher Winning Moves to celebrate the production of their 1,000,000th Monopoly set. Only 100 units were produced so it is quite rare. There are a couple of boards that I would like to add to my collection. Those include the Qantas Airline Edition and the new Millennial Edition in a dual language. The custom boards are the hardest to come by because they are created in very limited runs for customers and/or employees of a business. I have one from Royal Caribbean International. They actually invited me aboard a ship while it was docked. I spent the day on board and had a wonderful experience. I have a FIFA World Cup board from the Iceland National Football team. They were the smallest country to compete in the World Cup and the boards are very rare. I also own custom sets from Agri Mining, Honda Canada, and others. To celebrate the game’s 80th anniversary in France in 2015, Hasbro released a set that contained real money – €20,580 – instead of Monopoly money. Wouldn’t that be a great one to have! What advice would you give to someone interested in starting a collection? It’s an investment; start slow and don’t necessarily go for the expensive ones. And don’t open the games if they are sealed. You lose 80% of the game’s value by doing that. What resources do you use to acquire knowledge about Monopoly and connect with other collectors? There is a group of about 20 of us from around the world – United Kingdom, America, Canada, Australia, Holland, Germany – who collect Monopoly. There’s a lot of knowledge within the group. World of Monopoly is a good place to see all the boards that have been produced. 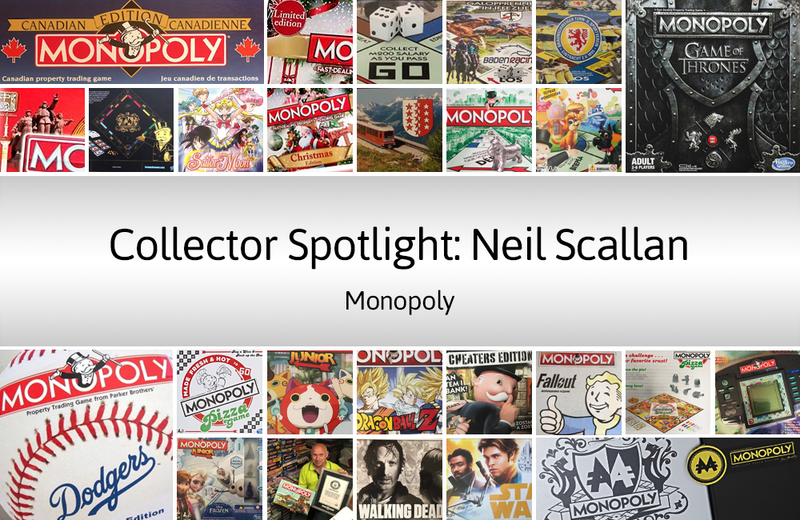 Like Neil’s Facebook Page to follow his collecting journey.